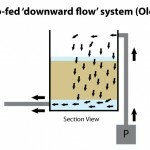 Reasons for Horizontal Flow versus ALL other flow patterns. Again, this is covered in greater detail on the main website but hopefully, these animated graphics should emphasise the importance of what is probably the real basis as to why ERIC Endless River Systems have been produced in both ready-made and DIY units. I will cover the mechanical stage of the ERIC units in more detail later but this page covers only the biological stages of all popular pond filter flow patterns as well as ERIC designs. Perhaps it is first best to detail what the ultimate requirements would be in order to provide perfect biological filtration to our pond systems. To explain it in mere words is simplicity itself and can be further explained by the following sentence. However, to achieve this perfectly in practice is almost impossible! Many have tried and all have failed over many years in both aquarium applications and pond applications. 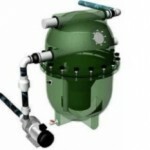 We have had ancient downward-flow; upward-flow; circular upward-flow; shower applications; pressurised applications and. of late, I am suggesting horizontal flow applications. Not one of these methods will achieve 100% perfection purely because water is its own master and does not like to be told what it should do or what it should not do! In view of this then the best principle to adopt is the one that produces the best results from the available options. One thing is certain and that is a river situation is the most ‘natural’ flow pattern of all these applications. However, it is best that we briefly consider all these flow patterns yet again in order to find out why there has to be ‘a best of the bunch’ and, if so, just how much ‘better’ it is than the others. Once again, if we must admit that we will never have true perfection here then it is very wise to consider using the very best alternative available to us. I feel that covering all these methods in fine detail is of GREAT importance despite the fact that many consider them to be ‘long-winded’. I must point out that I am not carrying out any form of ‘witch hunt’ here, instead I am merely trying to get across some information that may stimulate thoughts amongst some readers. Of course, these texts can be taken to others in this world who are officially qualified to be able to comment on my findings below and I do not consider anything in the texts to be anything other than basic common sense. I think I have made my views extremely clear regarding these disasters on my main website…. This very early DOWNWARD-FLOW design is hardly worth a mention and was first employed when most of us had never even heard the words ‘biological filtration’ used before. Reasoning behind it was that the falling water would pass through a strainer-type media and any debris would be trapped inside the media itself. It did just that and remained captive inside the media until the various hitherto ‘easy routes down’ became blocked with accumulated mechanical debris. This caused the falling water to find an easier series of routes to take and so on. If this was left unattended, all the routes became blocked and so the water simply found an exit over the top of the box and spilled over onto the garden. Many ponds were drained to almost nothing, many fish losses followed and many submersible pumps burned out as a result. As to the biological filtration capabilities of these boxes – it may just as well have been ZERO. This next example shows the UPWARD-FLOW design first employed in the early 1980’s and still the most used system today around the world in all its various manners and guises. 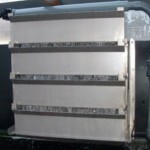 Some of these guises are pump-fed with gravity return; gravity-fed with pump return; surface side exit; surface central exit; surface trough exit; circular upward-flow patterns; multiple chamber units; aerated fluidised media systems and many other variations. Again, these relate to a body of water moving upwards in any given container/box. The next illustration below shows a side off-take box with heavily aerated semi-buoyant plastic media media as opposed to fixed-position block media, this method is more commonly used in intensive fish farming applications. The intention is that ALL upward flow incoming water will touch ALL parts of the rapidly-moving media surfaces as it rises. Visually this looks very convincing as a result of it appearing to be ‘busy’ but, as in the example given above, the incoming water, with impetus, merely continues to track directly to the side exit where it is continually pulled towards by the pump. The majority of heavily-aerated media particles still remain in the surrounding water completely untouched by the constant incoming supply that passes through the ‘invisible tube’ directly to the exit. In truth, all of these various methods are EXACTLY the same as each other and work on the very true principle that water rises perfectly uniformly when allowed to rise upwards from the base of any box or container. This leads to another very true fact, which is, as water rises uniformly through a suspended captive bed of inert surfaces (a filter media barrier), then this will supply ALL media surfaces with a constant flow rate of water – and it does just that, perfectly! Sadly, it only does this only ONCE and that is when the empty box is filled FOR THE VERY FIRST TIME! The very moment that water is allowed to overflow the top of the box by exit pipe or be sucked off the top of the box by pump then disaster results. This ‘disaster’ comes by the name of ‘tracking’ as displayed with the above animations. This is simply explained by the fact that incoming water to the box, either by gravity or by pump has impetus, motion, movement, force or current behind it – call it what you will. This incoming, moving water has one idea in mind and that is to get to the point of exit at the top of the box, which also has equal movement – either by gravity or by suction. As can be seen, this reduces the constant coverage of the media surfaces to a pitiful usage of only 15% of the surfaces contained within the box. In truth, the box may well be 85% smaller in dimensions for all the actual use it is. Another VERY disturbing fact is that most of the water within the container through which the tracking occurs is almost stagnant and therefore potentially dangerous, and will remain to be just that until the problem is attended to! The only way this problem can be resolved is to empty the entire box in order to find the stagnant water, and then throw it away – and as regularly as is possible. This however does not have any effect on the coverage of the biological surfaces within the box when re-started. Furthermore, by linking additional identical boxes together as ‘multi-chamber’ applications, this merely complicates the matter further and only increases the amount of stagnant water within the overall system accordingly. The first of these systems were employed outside of Japan around the early 1980’s – almost 30 years ago, needless to say, thirty years of experience has resulted in being able to address these significant shortfalls today. As we all know, better designs will usually replace older less efficient ones in just about everything we use. (This very dangerous situation is further compounded by those ‘armchair wannabe filter experts’ who actually openly recommend PERCENTAGES of water volume in the filter stage in direct relationship to the water volume in the pond. For instance they spout to others that a ten percent of the total system volume is contained within the filter box/boxes (same thing) at all times. The trouble is that some other people listening or reading, actually believe them – some have even been seen to congratulate them! Let’s take a real example here of a system containing 20,000 gallons for ease of calculation purposes. By foolishly taking the 10% recommended by the guru, this requires a filter box or boxes that retain 2,000 gallons of the system’s water. To give one idea of the box dimensions required to hold this volume it would be a perfect single cubic box with dimensions of just a touch over seven feet or, to give another example, a series of five, four feet cube boxes, linked together in order to hold the same amount of water. The task now is to get ALL the incoming water, at whatever flow rate is applied, to pass through AND OUT of these boxes constantly. From the illustrations already given, this is a pure impossibility and simply produces huge amounts of still, unmoving and stagnating areas of toxic water within the boxes that have no possible chance of passing on their contaminants to the bacteria waiting on the media surfaces. Once again the finger points to the shortcomings of the filter system and the unwanted debris and stagnation accumulated whenever ‘The Three Big Downers’ are mentioned and this should give some valid reasons as to why the statement is made in the first place. To summarise on the subject of ALL upward-flow boxes in ALL their guises and ALL of their multi-chambers, the truthful answer is the same for ALL. Not only are they less than 20% efficient as far as to the biological coverage of all incoming water to the entire media surfaces are concerned – they are also potentially extremely dangerous to boot. Shower filter systems are, thankfully, much safer and more effective biologically than the previous applications and it is painfully obvious that NO possible stagnation of water can occur at all. There are many forms of these on the market today but all work on a pumped supply of water from the pond which empties above the shower by way of a spray bar assembly in order to attempt to distribute this as evenly as possible throughout the narrow but long top trough below it. This top trough is perforated at the base and the downward-flow water then passes through a series of perforated troughs each below the other before finally returning to the pond by gravity. All these troughs contain biological surfaces which can consist of different forms of inert media. It goes without saying that open falling water will stimulate substantial beneficial dissolved oxygen content just in its action. Some of these units are used as ‘add-on’ items whilst others, like the Bakki Shower, designed, used and promoted by Mr. Micheo Maeda of the Momotaro Koi farm, are stand-alone biological stage filter systems. From reports given by several users, there is a very real need for a mechanical stage prior to these Bakki Shower units. As to best media choice for use in these troughs there is no doubt at all that the porous and naturally costly ‘Bacteria House’ fired clay section is the only real serious media choice available for this method. However, like all other things in life, there are those around who wish to capitalise on the idea by using cheaper (and MUCH less effective) media beds. In truth, the containers, like all other containers, are merely boxes and the real secret of the Bakki Shower is the porous, retaining properties of the Bacteria House media itself. With regard to the falling water that supplies the media within the troughs there is no possible control over it whatsoever and it will fall where it will fall randomly in an ever-changing pattern. In view of this, a constant supply of ALL falling water to ALL media surfaces is not possible nor will the unexposed undersides of the media receive much, if any, constant water flow. This is despite the fact that, because of this uncertain control of falling water, the increased flow rates over the media require that the entire pond volume needs to be passed through the showers twice in one hour. There are many other downsides to this system especially when used in an outdoor garden pond situation not least the way of disguising them from view. Other problems are high winds and the cooling effect of falling water in winter air temperatures. These particular downsides are far less problematic when used in an indoor set-up. Once again, the Bakki Shower system, as opposed to other showers on the market, is far superior to the upward-flow units covered earlier even taking into account that the undersides of the material cannot get a constant flow of falling water. But to give it a percentage rating as to its ability in ALL the water passing over ALL the media surfaces with a constant flow rate, I would estimate that this is little more than 33% efficient. I think I have made my views extremely clear regarding these disasters on my main website. How the manufacturers and the retailers of these items of uselessness can sleep at night knowing full well that the biological stages cannot possibly operate at all without aeration is completely beyond me. As to the people who buy them, it has to be as a result of their existing inefficient filter systems, sales patter given by the seller or the labour-free convenience of sitting them on a patio and starting them up immediately – or probably a combination of the three. Pond water is pumped into these enclosed chambers under pressure, it is then supposed to be stripped of mechanical debris before passing through to the biological surfaces – usually plastic beads – and then exits by pressure at the top of the unit to be passed back into the pond. Whichever way one looks at this, in truth it is only an enclosed pump-fed upward-flow box like the ones mentioned earlier. Water with impetus is introduced and needs to find a way out as quickly as possible and it does just that. However, we are led to believe that, on its upward travel it also passes through ALL the media surfaces within the container to give a constant flow-rate per square inch per minute. That’s the theory anyway but that’s a million miles away from what really happens as many, who have smashed these items of magnificence up in desperation after finally realising how useless they are, will bear witness. This shows just one example of the many units available, yes they do trap debris, they have to do but for how long they do this is another matter. As to how efficiently they get rid of this putrid collection that is building up constantly is also pure wishful thinking. It also does not take a man of science to realise that this would be far more easily achieved by way of a very, very long tube with the same diameter bore of the pump outlet stuffed full of discarded ladies’ tights. But how to clean the tights periodically in order to remove the debris is another matter altogether! The good news, for the numerous manufacturers, is that no one can actually SEE the time bomb that is ticking away within! As to the percentage chances in passing ALL incoming water from a fishpond over ALL biological surfaces in the pressurised box with a constant flow-rate – how about a VERY generous 5% – but the added damage they do is far greater! 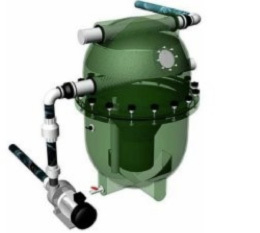 These units readily-available today are all derivatives of the original swimming pool sand filters used for many years and are still successfully used today for this purpose PURELY AS ‘MECHANICAL STRAINERS’. They do their excellent trapping and discharging work aided tremendously by chlorine bleach-based additives in the swimming pool water but please do not try this with fish! Over the years many budding would-be ‘Koi entrepreneurs’ have picked up on these units whilst taking a swim and thought that this may be ‘a good earner’ if made to look revolutionary and very technical in appearance. The sad part is these people actually believe their ‘inventions’ work but I’ll bet not a single one of them even keeps fish – let alone Koi! Finally on this matter, the next time I see even one of these units in operation in a Japanese breeder’s indoor house system will be the very first time. Again tracking takes place as can be seen in the animation and this produces no more than 20% overall efficiency. But by narrowing the box and making it shallower and longer like a river as shown below and then placing more barriers inside this is what happens. Again, exactly the same tracking occurs but, purely because there are three barriers to face, the distribution to surfaces is three times more than the earlier example but, by no means, being even near to be able to be termed as anywhere near ‘satisfactory’. In ALL of the above examples the results shown and animations/explanations given do not require the readers to ‘believe me’ in any way. Instead they are just plain, common sense facts when explained and simplified. There is certainly nothing even nearly ‘new’ about what I have detailed above. 2. Contained within a Narrow, Shallow and Long box. 3. With Very Heavy Water Turbulence and thus total confusion in the CAPTIVE small spaces prior to each barrier. This now produces an ever moving and totally captive ‘BLOCK’ of water as opposed to an invisible central channel. As this block moves forward endlessly at a rate dictated by the suction rate of the pump, it passes through the entire width and depth of the media barriers (more on these barriers later) to produce a staggering constant coverage of ALL media surfaces with an estimated 85% efficiency. The animation below is the ERIC FOUR unit and will hopefully explain much better than words as to how the endless BLOCK of water moves along the river. The colours show ammonia-rich water in red which fades gradually as it passes through to the end of the river to show non-toxic blue water which is returned to the pond as shown. 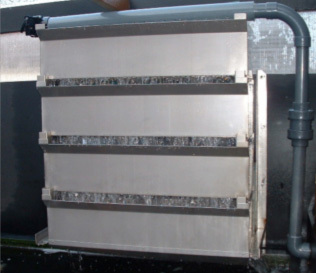 The black flecks entering the box from the bottom drain represent mechanical debris. The ERIC FOUR unit holds 116 gallons (530 litres) of water; this example is based on a pumping rate of 1,400 gallons (6,360 litres) per hour. At this flow rate, the 116 gallons (530 litres) of water passes through the box once every 5 minutes and the five divisions below the animation represent minutes elapsed per ‘pass’. Each ‘pass’ is numbered to show the present ‘pass’ exiting the box and the new ‘pass’ entering the box. There are two reasons for showing this animation. 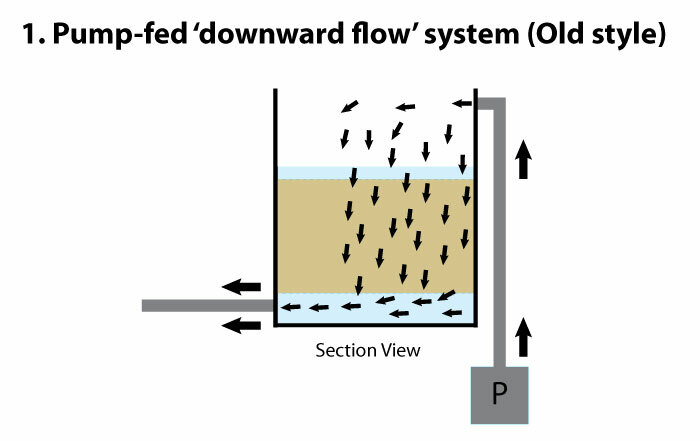 One is to explain that, like a downward-flow shower unit, very little stagnant water remains within the box at any given time, instead it is processed and returned to the pond before the next ‘pass’ enters the box – this can only happen in a horizontal-flow situation where water moves forward constantly as a block. The second reason is also important as a result of reason one above. By passing through the box every five minutes this relates to the block passing through the box 12 times per hour or 288 times in any given day. In view of the length of the ERIC FOUR box this computes to 1,920 feet per day or 130 miles per year. There is nothing in the above texts that requires anything other than pure common sense to understand what is written within them. These are not my personal ‘opinions’ they are merely simple facts that any water-flow technician will confirm. However, it is also true to point out that I have arrived at these simple conclusions after some 37 years of being involved in the matters on a day-to-day basis – if it has taken me some 37 years to arrive at this, it should also confirm I am not particularly ‘clever’. Whilst I do openly admit that ERIC systems, operated correctly, will only produce around 85%? flow rate efficiency to all biological surfaces (at a reasonable operating cost), in view of the other options available and their percentage results, I’ll settle for 85% efficiency in 2009! Up to now, I have only outlined the outer box of ERIC and the water flow principles behind it. On the next page I will show the most more important parts that are contained within the box itself and exactly why the modern-day ERIC is so deadly in performance.